According to Elizabeth Schneider’s book Vegetables from Amaranth to Zucchini, purslane (Portulaca oleracea) is a lost-and-found vegetable. 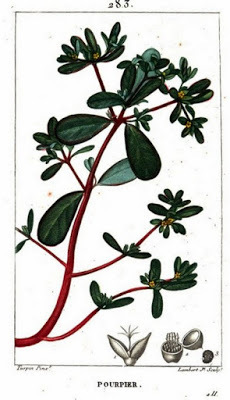 Native Americans ate the plant for centuries, it was popular in renaissance England, and Thoreau even wrote about a dinner of purslane he gathered in the field in Walden (in the chapter entitled “Economy”). Although it has not been forgotten in most of the world, in the United States it was hard to find until recent events brought it back. One event was its appearance on high-end menus as a “wild vegetable.” So popular was it in the late 90’s in New York that Ruth Reichl wrote about it in a New York Times article called “The Weed That’s Wowing New York” . Another event that led to purslane’s reemergence in the U.S. is the discovery that it is one of the few plants that contains omega-3 fatty acids. The Oxford Companion to Food says that the plant is native to Central Asia, and had been eaten for thousands of years, including ancient Egypt and classical Greece and Rome. The greens have a distinctive appearance: a sparse collection of thick, soft leaves on reddish-brown stems. The upper side of the leaf is more richly colored than the underside, which also has a ghostly white hue to it. They remind me of a miniature jade plant. 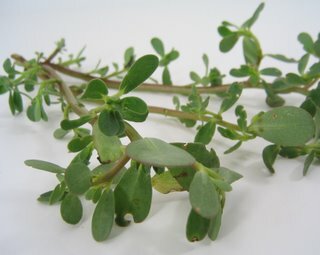 The purslane I purchased had a distinctly grassy flavor when raw, so although there are recommendations to use it in salad, I decided to cook it. After all, I was inspired to buy this green by an interview with author and tour-guide Nancy Zaslavsky on KCRW’s Good Food radio show, in which Ms. Zaslavsky described her Mexico-inspired method of cooking it. Following her 10 second overview, I removed the tough stems from the purslane (this vegetable is too new to me to be sure how to tell which ones are “too thick”), washed the greens, chopped them roughly, and set them aside to drain. Then I cooked some sliced white onion in oil in a skillet until was soft, added a clove of minced garlic and a minced serrano chile, stirred a few times, then dropped in the purslane. I cooked the mixture over medium-low heat for about 5 minutes until the greens were done. After adding a bit of salt, I served them with some masa-based fritters, garden-tomato salsa, avocado and crumbled queso cotija as part of my Labor Day lunch. The cooked greens were tender and the stems were not stringy. The flavor improved upon cooking—the grassiness dissipated and was replaced by hints of lemon and spinach. The only place I have seen purslane for sale is at the Farmers’ Market. The farmer who sells roses, kiwifruit, greens and local avocados at the Berkeley market has it regularly, and Catalan Farms brings it now and then. Since it is popular in Mexico, you might also find it at a Mexican market, possibly under the name of verdolaga.